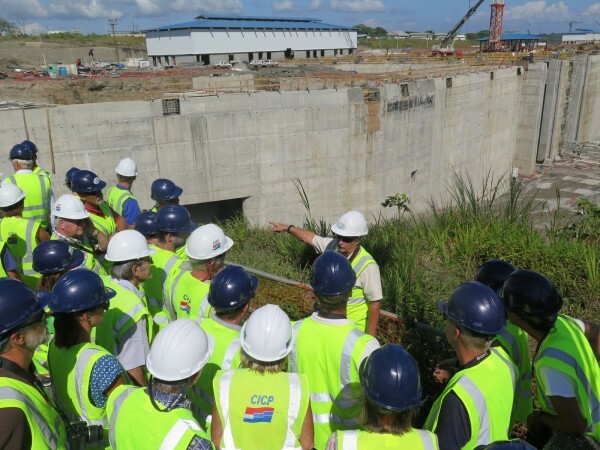 On Friday 13th February the sailors from the Blue Planet Odyssey and Pacific Odyssey had a memorable visit to the construction site of the new canal. The Panama Canal expansion project is intended to double the capacity of the Panama Canal by 2016 by creating a new lane of traffic and allowing more and larger ships to transit. The vast project involces building two new locks, as well as excavating new channels and expanding existing channels. Following this, the participants met with the president of the Panama Canal Authority, Sr Jorge Luis Quijano, which was a fantastic culmination to the day. 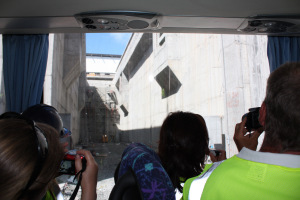 Jimmy Cornell organized for all of us to go take a private tour of the construction site of the new Panama Canal, then head into Panama City. The new locks are incredible – truly a feat of human ingenuity and engineering. The project manager gave us an overview of the project. The process of installing the gates is particularly impressive, as they are absolutely massive but are rolled into their slots on hundreds of wheels by a single remote control, a few centimeters at a time. Then we actually took the bus along the bottom of the entire set of locks – the sheer scale of it is amazing. 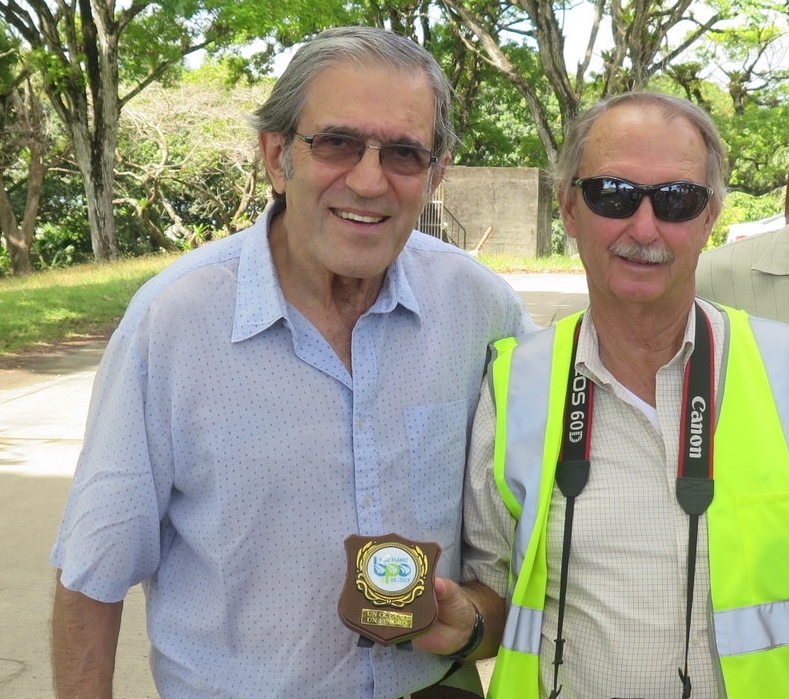 We all met back up at the canal administration building, where we were received by the Presidente of the Administracion del Canal de Panama – a polite, friendly gentleman who spoke a bit about the new canal project and signed all of our souvenir logbooks. Our bus route required that we drive across the existing canal. At the Atlantic end there is no permanent bridge (yet), so driving across is accomplished via a one-lane movable bridge that is swung into place when a ship is not passing. As it happened, just as we were crossing the lock doors were closing on a Panamax ship, which is the largest ship that can go through the Canal. This photo from the bus gives you a sense of how it “just fits” into the old lock. On to the construction site of the new north-side locks. Jimmy introduced Dave Wilson, who is an American ex-pat, a sailor who fell in love with Panama while living on his boat, and a project manager for the construction effort. We keep Dave busy for the next hour or two with endless questions. But first we all must don hard hats and high visibility vests. From this vantage point we see a set of three huge retaining pools that will be used to hold the water released from a lock as a ship descends, so the water can be re-used to fill another lock. This design (which has been used for hundreds of years, but not at this scale!) 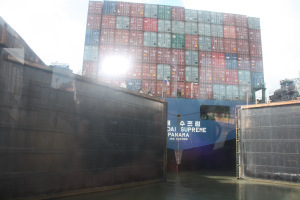 will allow the new/large locks to operate with about the same amount of water loss (from the lake) as the old locks, yet the new ones will accommodate three times more tonnage of cargo in the transiting ship(s). This leads to some environmental impact thoughts. 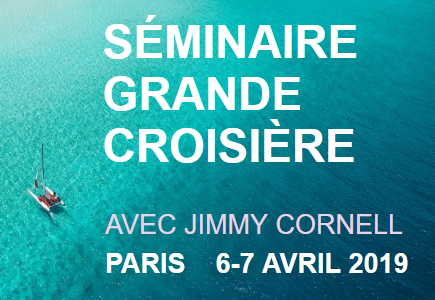 Of course the water concern is more about retaining the expected depth of the lake, to accommodate the large ships, than it is about the environment, yet the project design seems to include a serious focus on the environment. For example, for every tree cut to make way for the new channel, two were planted. And a contractor was hired for the sole purpose of moving individual animals, from spiders to crocodiles, away from the construction area. We drive in the bus down to the lake-end of the new locks. 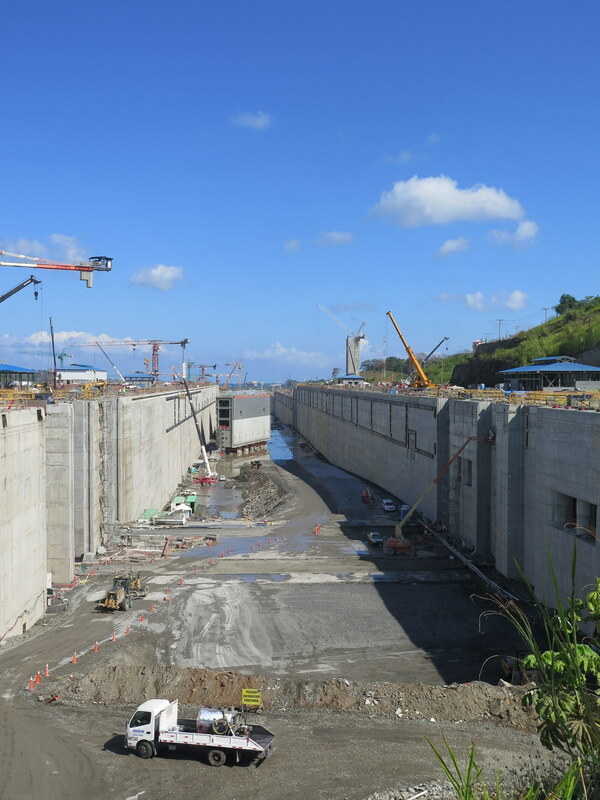 We’re on a narrow strip of land with Gatun Lake on one side… On the other side we are looking down into the length of the new locks. Dave explains that where we are standing is the “Gatun plug,” and it has been the source of perhaps the most sleepless nights of the project. It is this strip of land that will be excavated last, and until then it is preventing Gatun Lake from draining into the new locks (potentially killing workers, destroying some of the work, and draining the lake such that it would require several years of rainfall for it to fill back in after a new plug were constructed). The “plug” has been reinforced with concrete shafts, and is constantly monitored for any sign of leaks. As anyone knows who has built dams on the beach, if a leak gets started the dam will wash away, with little hope of stopping it. One of the notable features of the locks is the “gates.” Instead of having swinging/opposing pairs of gates, like the old locks, the new locks have massive gates that slide across the channel (and which can be moved into different recesses for maintenance purposes). The gates weigh up to 4000 tons each! One hundred feet tall, 180 feet wide, 10+ feet thick. Back on the bus, Dave tells us that “if they don’t stop us” we’re going to now drive down into the locks! We will be one of the first to “transit” the new canal. They don’t stop us. Jimmy presents Dave with a BPO plaque, and we give Dave a big round of applause. What an amazing and unique experience! Nicaragua are (maybe) building a canal to compete with the Panama Canal. Our host had obviously addressed this issue many times, and it was interesting to hear what he had to say about it. The Panama Canal is a huge part of the Panamanian economy — extremely profitable, so of course they are paying attention to all the alternatives. There is the possibility of ships using the Northwest Passage. But despite the effects of climate change, this remains a risky proposition, where a ship might approach the area only find that the route is closed. Or worse, find themselves caught in the ice. There is Cape Horn, but that is very far out of the way, as well as being plagued by severe storms. And there is “the other way around.” i.e., travel from China to the US East Coast by sailing west, via the Suez Canal, instead of east via Panama. The latter option, especially, is primarily a time/cost/fuel financial calculation. Big ships, by the way, pay more than a quarter million dollars to transit the Panama Canal transit. Senor Quijano was very diplomatic about the Nicaragua project. 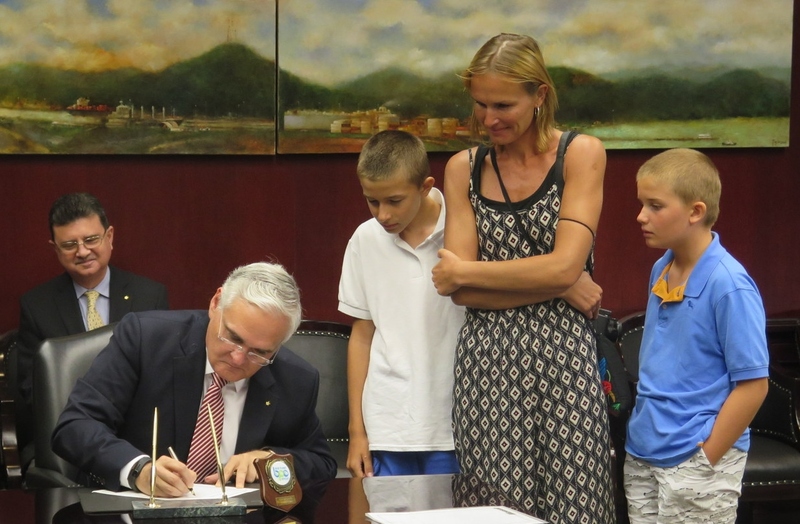 It will require excavating 10 times the amount of earth excavated in Panama in total over the past 130 years. The Panama Authority has a pretty good idea, based on very recent experience, what it takes to dig a big ditch. The Nicaragua schedule is to build it in five years. Senor Quijano says to accomplish that they would have to import half a million Chinese, and build all parts of it at once, which would add many challenges. And he asserts that there is not sufficient demand to support two canals, so if another one is built they will have a price competition, and thus the financial return expected in Nicaragua would probably not be realized. I am making no assertions about any of this, but I found what he had to say extremely interesting. We then presented him with a Blue Planet Odyssey plaque, promised that Jimmy would invite him to his boat when Aventura arrives in March, and thanked him profusely for meeting with us. Back on the bus, we sit in city traffic for an hour, and then an hour on the highway back “home” to Shelter Bay. Long day. Fabulous day! We spent the day touring the new Canal with its mega-sized new locks so deep and wide and, ironically given my last place of residence, so sculpted to accommodate ships carrying liquid natural gas. I lived in Bradford County, PA, home to the Marcellus Shale and putatively one of the world’s richest deposits of natural gas … being mined through the technology of “fracking”. Seeing it from the Panama Canal perspective brings home the broader global economic story. These new locks are gargantuan testimonies to how tiny we are in the scheme of the advance of fossil fuel. Even the original canals are massive with container ships, tankers, and the wee cruising boats endlessly traversing the 30 odd miles from east to west and the reverse. 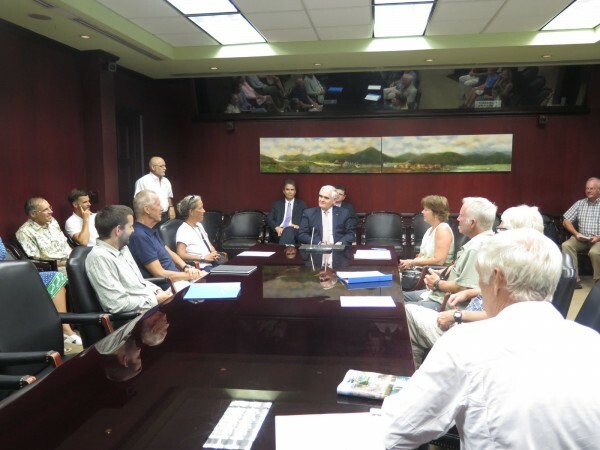 In spite of my own feeling of impotence to stave the seemingly irreversible tide of history, it was humbling to conclude our tour which ended in Panama City in a meeting with the president of the Panama Canal Authority: Jorge Luis Quijano. We thirty or so BPO participants met with him in his conference room where he quite engagingly and accessibly chatted with us for a while, signed our log books, and presented us each with a souvenir Panama Canal cap. We got to ask him questions about his work and the future of the Canal as well as to learn more about the just started Canal initiative in Nicaragua. From the President’s perspective this Chinese funded project is an inevitable loser and from his overview I would have to agree. Does the world need another canal? Obviously, Panama has a 120 year historical bias so who am I to render an opinion? Nonetheless, the realm of canals, fossil fuel, make me feel less than miniscule in understanding much less influence its trajectory.